As sure as we will always wonder if an unaccompanied tree falling in the woods makes a sound, Green Party candidates the world over will always struggle with their own paradox. If you’re so green, what’s with all the flyers? Maybe only when, or if, the Greens shed their fringe party status and convince people to start thinking like they do will their campaign methods stop being called into question. But for now we had to ask: how easy is it being green on the campaign trail? The traditional markers of a federal election campaign are not exactly eco-friendly: leaders private-jetting across the country, lawn signs stacked two and three deep, mailboxes stuffed with flyers, and computers and lights glowing late into the night at local campaign offices. So how do you greenify a Green campaign? We made plans to chat at City Hall since Scott would be speaking to the executive committee about plans to cut citizen advisory committees. “I will be the old bald guy in the black “ONE LESS MESSENGER” T-shirt,” he told me by email. So I set to scanning committee room 2 for a bald man in a black T-shirt who looked like he was into bikes. Scott suggested he was kind of well-known in citizen advisory circles, and sure enough when I asked a girl in an bike activist T-shirt if she happened to know Wayne Scott, she said she’d never met him, but she had a photo of him on her iPhone. I finally spot the real Wayne Scott and just as we’re heading down the spiral steps to find a place for a quiet chat, a security guard comes up to us with a directive from his boss. He’s talking about Wayne Scott’s campaign office: a trike with campaign signs plastered all over it and, hanging off the back, a hockey-stick flagpole flying the Canadian flag. “This way I’m campaigning wherever I go,” says Scott. 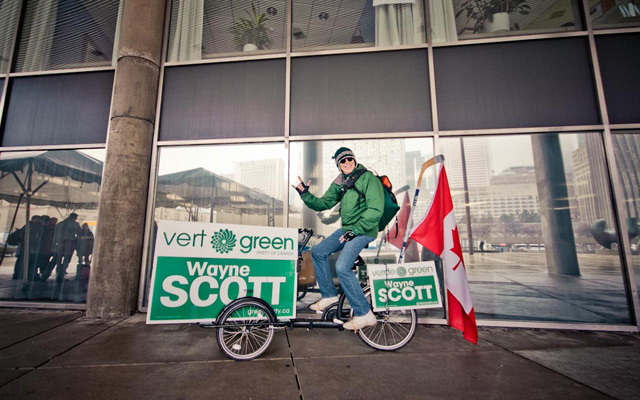 Camille Labchuk, the Green Party’s deputy director of communications, didn’t know about Scott’s campaign office trike until I told her, but she thinks it’s classic Scott and a great idea. In some urban centres, the entire sign team travels by bicycle, candidates shuttle to events and debates on bikes, and some host group rides as media events. When bikes won’t do, the party tries to use hybrid cars when they’re available (party leader Elizabeth May is using a hybrid in her campaign). And when bikes and cars won’t cut it, it’s on to planes and trains. May travels by train and flies commercial, rather than private—if at all. But since May is in a tight race for the first-ever Green seat in the House of Commons, she’s spent much of the campaign in her riding. 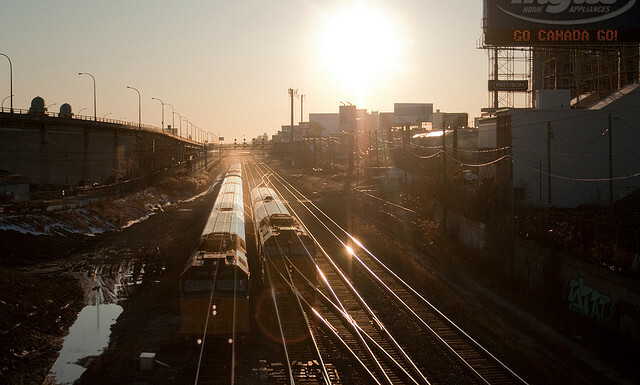 Photo by Caroline Ross from the Torontoist Flickr Pool. Labchuk says the goal is to have a carbon-neutral campaign, and the party will be buying carbon offsets to level out its impact. I asked if that’s something the other parties are doing too. Other Green campaigners shape their flyers and hand billets like bookmarks so they can be re-used. They hand-paint campaign signs and banners on old fabric. Some even print their materials on “plantable paper.” When paper that can be planted and nurtured into a mini wildflower garden isn’t readily available, the Greens will at least try to use environmentally friendly signs and brochures, printing on FSC-certified paper and using vegetable inks. And they make an extra effort to source local printers to keep shipping costs, both carbon and monetary, down. Plus Green Party campaign offices, those that occupy brick-and-mortar office spaces, tend to operate in a very eco-minded manner, with recycling and composting bins and renewable power sources like Bullfrog Power. “Our candidates get super creative, and being Greens they’re always thinking of ways to keep emissions down, try to get more green stuff growing, and to reduce, reuse, and recycle, basically,” says Labchuk. It does sound basic. It’s the same message we’ve been hearing for decades. To Wayne Scott, these campaign tactics just “make more sense.” It just makes more sense to have a moving campaign office; it just makes more sense to have long-sighted platform policies so you don’t have to reprint your entire platform for each campaign. Scott ran in 2008 and says he’s been able to avoid printing new flyers because the policies and the message haven’t changed since the last time around. Scott’s bike-office is another holdover from his last campaign. In 2008, he rigged up a trailer with a campaign sign and managed to score some viral attention when the Toronto Star photographed him at Car Free Day. It’s the same photo the bike activist showed me on her iPhone. “We’re taking advantage of technology in a huge way in this campaign,” says Labchuk. Elizabeth May is holding virtual town halls over Skype, and of course Facebook and Twitter have become integral tools in any political campaign. Green campaigns have all the same goals, initiatives, and set-backs as other parties’, but with a whole other layer of concerns, as they try to win voters while protecting their environment. But to the candidates and staffers and volunteers, these extra green steps aren’t a bother—it’s their way of life. “For me, and our campaign, everything we do falls into the filter of, ‘How is this affecting our environment?’ That’s just the way we live. It’s certainly the way I live, because I know, everything I touch, there’s a cause and effect going forward. And I’m lucky because that’s always the way I’ve lived,” says Scott. Greens don’t want to be like other parties; according to them, they’re waiting for the other parties to catch up. And Wayne Scott’s campaign office is the fastest one you’ll ever see.